Key Points to Consider for SEO "HIGH PRIORITY"
Reputable sites that link to you will increase your reputation. After all, if a reputable site feels that your site is valuable enough to link to, that means that your page has more value. You can tell if a site is considered reputable both by how high it appears in search engines and it's Google PageRank. Also, .edu sites have a higher reputation because they represent schools and universities. Sites that are on .edu and .gov top-level domains have a large amount of credibility because they are very difficult to get. So if you can get the designers of those sites to link to you, that gives your site more credibility as well. 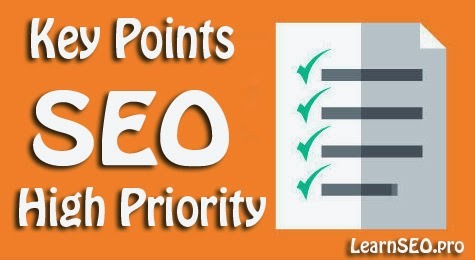 There are High Priorty Key Points to Consider for SEO. Which will help every blogger or webmaster to rank in search engine results.